During the time of the Ayleids, the city-state of Abagarlas worshipped Molag Bal and was gifted with a great weapon, the Mortuum Vivicus. However, the city of Delodiil pre-emptively attacked, and Bal was forced to withdraw the Mortuum to the Halls of Submission in Coldharbour. 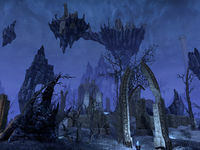 The most significant interaction between Nirn and Coldharbour was Molag Bal's attempted Planemeld in the mid-Second Era. In 2E 579, as the Interregnum dragged on and the Dragonfires remained unlit, Molag Bal's minion Mannimarco deceived Emperor Varen Aquilarios into using the Amulet of Kings to initiate a ritual that triggered the Soulburst. The ancient covenant between mortals and Akatosh was broken, and Mundus was set adrift in Oblivion, rendering it vulnerable to Daedric incursions. Molag Bal began deploying machines known as Dark Anchors to pull Nirn into Coldharbour, and sought to merge the two realms into one. The Tamrielic invaders were initially thwarted by Coldharbour's defences, being scattered all across the realm after entering a portal. 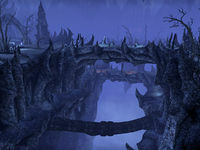 The Daedric Prince Meridia, an ancient enemy of Bal, opened the doors of her stronghold in the realm—the Hollow City—as a safe haven for the scattered invaders. After destroying the Great Shackle and assembling allies from all across Coldharbour, the Army of Meridia made a final assault on the Endless Stairs, where they successfully collapsed the Planar Vortex between Mundus and Coldharbour, foiling the Planemeld. Following his defeat, Molag Bal retreated to Heart's Grief, when Aquilarios chose that moment to strike. Using the Amulet of Kings, the Soulless One was blessed with the power of the Eight Divines, with which Bal was banished to the Void in his own realm. Following this, the Prince lost possession of all mortal souls he had captured. As well as the Daedra, many of the realm's inhabitants come from Mundus. The majority of the mortals are Soul Shriven, whose souls belong to Molag Bal and whose bodies are animated with a Daedric vestige in their stead. They live a life of eternal torment, cursed to slowly wither away without their soul only to be reborn. They are used for labor or amusement and eventually lose all sense of self. Some of the Shriven become consumed with hunger and turn feral, eating everything they come across - including lesser Daedra and each other. 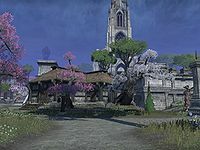 Other mortals live in isolated settlements for various different reasons, such as the Shadow Walkers of the Moonless Walk and the Argonians of Haj Uxith. Some species of flora and fauna even seem to thrive in the realm, including netch, bantam guar, scuttlers, and various types of fish. Esta página foi modificada pela última vez à(s) 15h46min de 2 de janeiro de 2016.